Central to these examinations is another test called the complete blood count (CBC). This routine assay measures the composition of your various blood cells in order to flag any changes that might fall outside of what would be considered a “normal” range. By doing so, the CBC can identify (and ideally prevent) the development of treatment-related side effects, as well as detect any disorders that may be related to HIV infection. What Is a White Blood Cell Count (WBC)? White blood cells, also known as leukocytes, are a subset of cells produced in the blood marrow, whose primary aim it is to fight infection. A white blood cell count (WBC) is performed as part of the CBC to measure these cells. A high or low WBC value can indicate the development of an illness or disorder and can be used by doctors to determine whether these changes are related to an infection, a drug side effect, or other conditions such as stress, tissue damage, or even allergies. Within the context of HIV, an elevated WBC typically means that your body is actively fighting an infection, the symptoms of which may or may not be evident. Other tests can be used the pinpoint the exact cause for these changes. By contrast, a low WBC suggests that some disorder, either HIV-related or non-HIV-related, is affecting the bone marrow’s ability to produce white blood cells. When this condition (called cytopenia or leukopenia) occurs, the body is less able to fight infection. 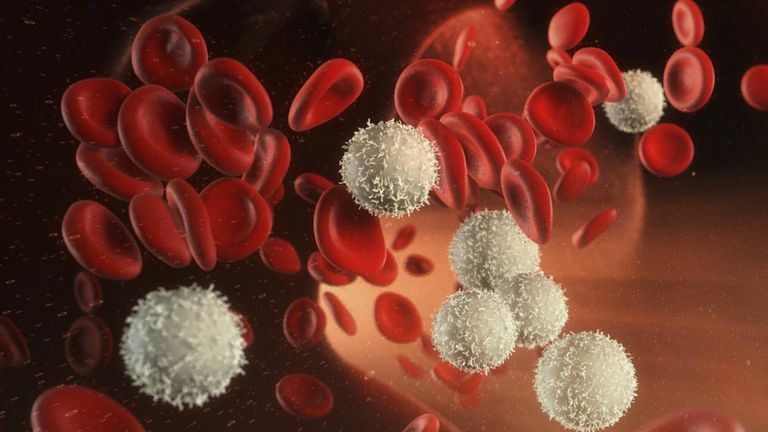 Among the most important white blood cells are CD4 "helper" T-cells and CD8 "killer" T-cells, which respectively trigger an adaptive immune response and aim to neutralize the virus. Additionally, there are cells called macrophages, dendritic cells, and Langerhans cells which comprise part of the body's innate (built-in) immune response. These cells function as the first-line defense whenever any infection agent tries to enter the body. What Is a Red Blood Cell Count (RBC)? Red blood cells, also known as erythrocytes, are responsible for carrying oxygen from the lungs to the various cells and tissues of the body. A red blood cell count (RBC) is performed as part of the CBC to measure the total number of cells in a blood sample. The RBC value is then used to evaluate the hematocrit (percentage of blood volume taken up by red blood cells), while an additional assay measures the protein in red blood cells (called hemoglobin) that are responsible for carrying the oxygen molecules. Very low readings of these values can indicate anemia, a condition wherein cells and tissues are not provided ample supplies of oxygen. When this happens, a person will often feel fatigued or exhausted, pretty much all the time, and may look visibly pale or washed out. Within the context of HIV, anemia is known to be one of the potential side effects of the drug zidovudine (Retrovir, AZT). If anemia is diagnosed while a person is on zidovudine, an iron supplement may be prescribed if the anemia is considered mild. In more severe or persistent cases, the drug may need to be substituted with another appropriate agent. Anemia can also be associated with an active infection or other causes, both HIV- and non-HIV-related. In some cases, chronic HIV infection can affect the metabolism of important vitamins, the deficiency of which can contribute to a person’s anemia. Severe cases of anemia are sometimes treated with erythropoietin, an antibiotic drug of which can stimulate the synthesis of red blood cells, or may require an intravenous blood transfusion to effectively top up these cells. Platelets, also called thrombocytes, are colorless cells that are involved in the blood clotting process. Low platelets values can lead to easy bleeding or bruising in the affected individual. Severe cases can even result in potentially life-threatening internal bleeding. The condition, known as thrombocytopenia, is associated with chronic HIV infection, primarily in people with advanced disease who are not yet on treatment. The initiation of HIV therapy can generally resolve the condition by suppressing the inflammatory agents associated with infection, which is known to deplete platelet numbers. Additionally, certain HIV drugs (especially nucleoside analogs) can cause low platelet counts, as well as HIV-associated opportunistic infections such as cytomegalovirus (CMV) and mycobacterium avium complex (MAC). Platelet counts are rarely ever so high as to cause health problems. Thachil, J. "Full blood count as a diagnostic clue to HIV infection." British Journal of Medicine. 2010; 341:DOI 10.1136/bmj.c4583. Das, G. and Baglioni, P. "Primary HIV Infection." British Journal of Medicine. 2010; 341:c4583.